Dried Elderberries suitable for home wine making. 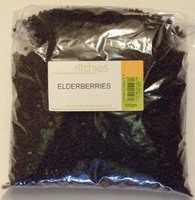 This pack of dried Elderberries (Sambucas Nigra) is suitable for use as an alternative to fresh elderberries when used as part of your recipe when making country wines. Most recipes suggest using 8oz/250gm of dried elderberries with 3lb/1.5kgs of sugar to make 1gallon/4.5ltrs of wine, so this batch will make approximately 1 gallons.